Fiona Kelly, curator at the Imperial War Museum, opened proceedings with a programme of extracts from wartime films made about and by women. She illustrated the key point that male conscription during World War Two offered opportunities for women like Jill Craigie, Kay Mander and Ruby Grierson (sister of the more famous John) to take key creative roles in the film industry. Available for viewing at the resource-rich IWM Film site are two films made by Ruby, Choose Cheese and They Also Serve, both 1940. At the end of the latter there is a short tribute to Ruby Grierson who died on board the ‘City of Benares’, an evacuee ship with 90 children that was torpedoed on its way to Canada on 17 September 1940. The filmmaker was on board making a film about the evacuees. Using ideas of the ‘flaneuse’ drawn, after Walter Benjamin, from Lauren Elkin (see her book Flaneuse: Women Walk the City in Paris, New York, Tokyo, Venice and London), Charlotte Hallahan explored how we might understand the film as Rosie Newman’s creation of her own historical narrative. Taking advantage of new modes of movement in the ruins of the Blitz, Newman can be seen to be asserting her identity and suggesting a new kind of female subjectivity. After which Hollie Price gave a terrific paper about the Ministry of Information’s mobile film units that took informational subjects to village halls and other non-commercial contexts, often working in informal collaborations with voluntary groups like the Women’s Institute. 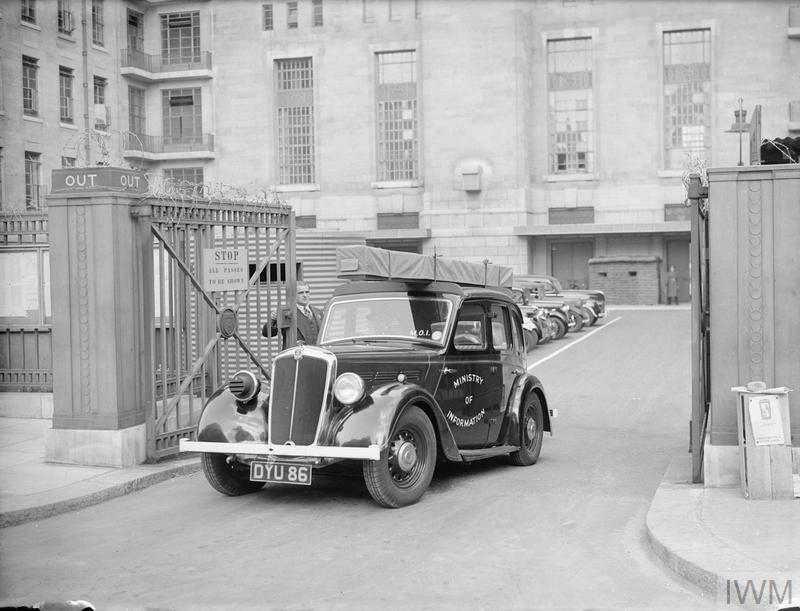 A Ministry of Information Mobile Film Unit car leaving MoI headquarters at Senate House, London. © IWM. Two key individuals that Hollie Price spoke about were new to me, but I want to know more about both. One is Thomas Baird, the documentary movement’s distribution expert, who was in charge of the MoI’s non-theatrical distribution during the war. The other is Helen de Mouilpied, who also worked for the MoI, becoming second in charge of the non-theatrical distribution section of the Films Division. After lunch Sarah Easen explored the parallel careers of the filmmakers Kay Mander and Margaret Thomson [the link is to Sarah Easen’s informative BFI screenonline essay about the filmmaker], a presentation that included a showing of part of the latter’s Making a Compost Heap, 1942. Both women achieved success in making factual films but neither was able to transfer this across to directing fictional features, and at the end of the 1950s Kay Mander returned to being a script supervisor, one of the industry roles traditionally associated with women. Helen Hughes offered ‘Looking for Diana Pine’, a paper that considered the films of this little-known filmmaker at the same time as it tackled key questions about authorship and gender. An extended engagement with this research has just been published in Screen, ‘The story of Atoms at Work‘, although this is only accessible to subscribers. 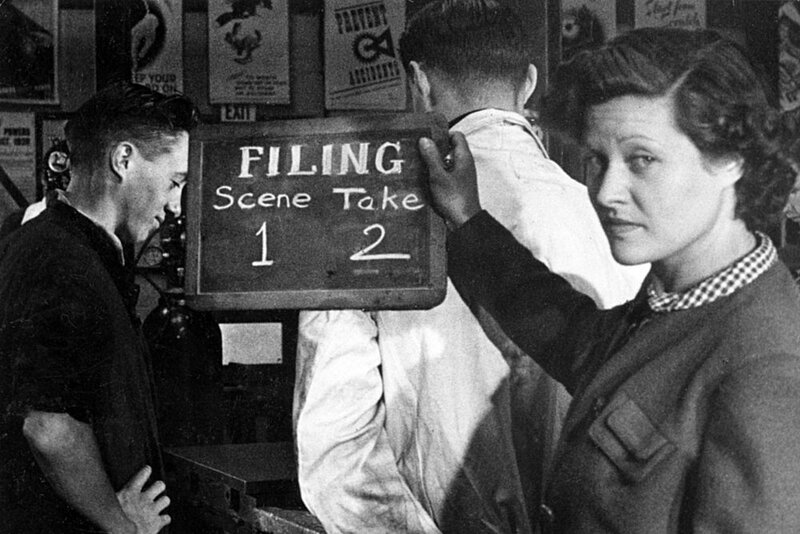 The rather remarkable film itself, Atoms at Work, 1952, is on BFIplayer. Charles Drazin returned to Jill Craigie, offering what he described as ‘impressions’ of his subject and sharing a part of an audio interview that he taped with her some twenty years ago. Both of the richly rewarding films that he considered in detail, Out of Chaos, 1944 and The Way We Live, 1946, are available for free on BFIplayer, although until recently both films were exceptionally hard to see. Drazin, author of the valuable The Finest Years: British Cinema of the 1940s, first published in 1998, set Craigie in the historical context of the post-war years, and detailed her professional relationship with the producer Filippo del Giudice. In 1936 [Marion Grierson] returned to journalism in as editor of World Film News, a vehicle for the documentary film movement and its ideals. Married to fellow documentarist Donald Taylor, she left her post as editor shortly before their first child was born, and subsequently all but withdrew from film work. In the 1940s, she returned to Glasgow, where she switched careers, working for the Youth Advisory Service until her retirement. Like others who we heard about during the day, Marion Grierson’s career was curtailed, at least in part, by the industry’s attitudes to questions of gender. The LSE’s Gillian Murphy also spoke about Jill Craigie, and in particular both her research fort an unrealised film about the suffragettes, many of whom were still very much alive when Craigie was trying to do this, amnd the circumstances of how her film To Be a Woman, 1951 (below) came to be made. A crowd-funding campaign by the Equal Pay Campaign Committee (EPCC), which was advocating equal pay for women in the public services, endeavoured to raise £5,000 for the film’s production (hey fell short of the target a guarantee made production possible). For more on this, see Jo Fox’s contribution for Talking Humanities, ‘Jill Craigie’s 1951 film, To Be a Woman, is “of, and ahead of, its time”‘. Tashi Petter considered yet another significant woman filmmaker, the silhouette animator Lotte Reiniger, and discussed the ‘useful’ films made by Reiniger as advertisements for the GPO and Crown Film Units. Perhaps the most remarkable – and strangest – of these is Mary’s Birthday, 1951, which I have embedded here. As well as identifying the pacifist sub-text of this short, Tashi Petter also suggested that this is one of the director’s films that treats official figures with a knowingly ironic sense of mockery. See also her post on animationstudies 2.0 about the director, ‘”In a Tiny Realm of Her Own”: Lotte Reiniger, Domesticity and Creativity‘. Finally, Melanie Williams, presented on the amateur filmmaking couple Laurie and Stuart Day, and in particular their elegiac production, 1938: The Last Year of Peace, edited a decade after its footage was shot and released in 1948. For more on the Days, and other mid-century amateur filmmakers, see the TNA Project research guide, which consider the cataloguing of the Institute of Amateur Cinematographers women filmmakers’ films. Melanie Williams demonstrated how revealing comparisons can be between amateur production and contemporary mainstream production. It was a privilege to listen to all of these papers, and it did feel that the day was a real contribution to, as panel chair Shilyh Warren said, the questioning of the processes of doing film history now. Ideas of authorship, of documentary, of the gendered nature of the industry and of historiography, and more had been put into play in ways that were both challenging and engaging. Brava.